If you’ve ever taken a close look at the vent hood above your oven, you might have been shocked at how dirty and, even worse, greasy it is. Sitting directly above the burners or heating elements, the vents are up high and not usually in our direct line of sight where you’d easily notice the grime. If you are short like I am, you might not ever know that there is gunk hiding on the outside of the hood, but tall people see it! When you use your stove, oils escape in the steam and smoke is created when cooking your food. If you have a natural gas stovetop, there are byproducts produced from the burning flames. If all of that smoke is not vented outside, it will be deposited on your counters, cupboards, walls and the ceiling and the mess just gets worse from there. Besides the obvious exterior of the vent hood, there is also the interior of the fan that needs to be cleaned. Whenever you run the fan, the same grease and gunk in the air and goes into the filter that is in the fan. Keeping grease and then the dust that gets trapped inside will take longer if the build-up is old and oxidized. The longer the smokey grease has sat, the harder it is to remove. With time the film is similar to,- and just as tough as a layer of paint. If you stay on top of it, you will end up an easier job and a much cleaner kitchen in the long run. Let’s break it down- it’s two different kinds of cleaning jobs. The biggest part of clean the outside of the hood is de-greasing, so you will need a product that is good for breaking up and removing grease. Depending on how much build-up there is, you might also have to go over it several times and use a good deal of elbow grease to get it back in shape. Avoid using abrasive cleansers because they can easily scratch the finish. Instead, opt for dish soap (which is amazing at breaking up grease) and an absorbent cotton rag (great at soaking up grease and scrubbing without scratching). Go over it a few times with some soapy hot water and it should clean up easily. For the toughest grease build-up, you might need to bring out the big guns. Try a solution of 50/50 water to ammonia and swipe a sponge over the hood with that. It should break up harder grease deposits. Rinse with plain water to remove any remaining ammonia residue. On a daily basis, you can opt for spray cleaners, like the ones you would use on your countertops or the multi-purpose cleaners that are good for glass and other surfaces. If you make cleaning the vent hood part of your daily cleaning routine, you won’t have to spend much time on it at all. Just wipe it down like you would the stove after you are finished cooking. It’s like the old saying: an ounce of prevention is worth a pound of cure. The filter on your oven vent hood often poses a little more of a challenge, but it’s nothing you can’t handle with the right products. The fan filters are usually made out of metal and can get dirty really easily, with all the cooking going on in the kitchen. The filter is made from a metal mesh designed to hold all kind of goop, from grease to food particles. It’s where the grease is supposed to go. Remove the filter and any other non-electrical parts, like the light cover, which is usually plastic. In some cases, even repeated soakings with dish soap aren’t enough to get the filter really clean. In that case, get some fume free oven cleaner and coat the filter with it. Let it sit according to the product’s instructions and then rinse. It’s only in rare cases that the filter needs to be replaced, but the cost is minimal and most times you can get them clean with the steps I’ve outlined here. 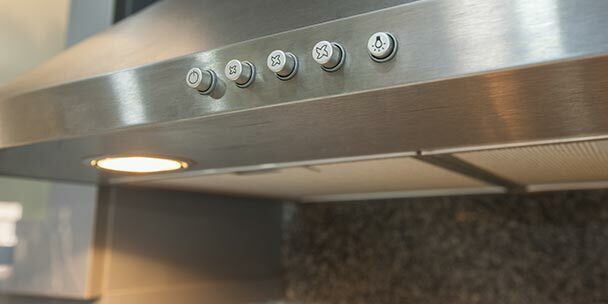 Keeping your oven vent hood clean is the finishing touch on a clean kitchen. You will feel like your kitchen is totally clean when every part sparkles!